The Celtic goddess Belisama comes from the south of France, where two inscriptions, from different areas, suggest that her cult was fairly widespread. One of them is to the goddess herself, while the other calls her Minerva Belisama. The first is signficant, since it shows that her cult was from pre-Roman times. 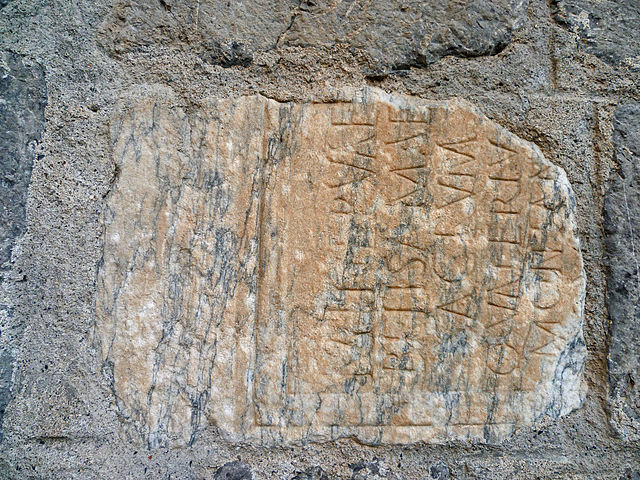 Inscription from St. Lizier. From Wikimedia. A nemeton was often a sacred place set aside for worship, which no profane person could enter. It would be laid out as a quadrangle, with trees here and there and a ditch marking its boundaries. A hollow altar would be at the centre. 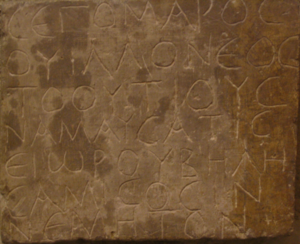 Inscription from St. Lizier to Belisama. From Wikimedia, author Olybrius. This would imply that Belisama was one of the many Minerva-type goddesses of the Celtic world, the most prominent being Sul and Brigantia, along with the Irish Brigit. The god Belenos/Belenus has a very similar name, and he is sometimes accompanied by an unnamed female figure, assumed to be Belisama. Belenus was often called Apollo Belenus, and a poet from Bordeaux, writing in the 4th century CE, said one of Belenus’ priests was named Phoebicius, a title that referred to the god’s light-giving aspect. (Green: 31) The god seems to have been far more popular than his sometime consort; he is certainly better attested, with inscriptions from Aquitaine, northern Italy, Austria, and possibly Britain. As Apollo Belenus he presided over several healing shrines, and little clay horses were offered to him, presumably because of the solar/equine connection common in Celtic religion. He was also offered images of swaddled infants, a poignant reminder of the high infant mortality rate in earlier times. The actual names Belenus and Belisama may come from a root bel– meaning “bright” and a suffix –isama– which means “most” or “greatest”, which would make her the most bright, or brightest. (Lindsay: 740) Other scholars dispute this, and see the bel– in Belisama and Belenus as meaning “strong”, so Belisama would be “The Most Powerful”, which would tie in with the more martial aspect of Minerva. A final note: while Belenus seems to have been associated with healing shrines, especially ones with water, Belisama does not seem to have any such connection. She may, however, have been the goddess of the Ribble river in Lancashire, England. Ptolemy’s Geography (2nd c. CE) places “Belisama Aest” (estuary) at the mouth of the Ribble, flowing out into the Irish Sea. Green, Miranda J. 1992: Dictionary of Celtic Myth and Legend, Thames and Hudson. Jufer, Nicole and Thierry Lunginbühl 2001: Les dieux gaulois: répertoire des noms de divinités celtiques connus par l’épigraphie, les textes antiques et la toponymie, Editions Errance, University of Virginia. Olmstead, Garrrett 1994: The Gods of the Celts and Indo-Europeans, Verlag des Instituts für Sprachwissenschaft der Universität Innsbruck. This entry was posted in Celtic, Gaulish, Goddesses, Mythology and tagged Apollo, healing water, MInerva, rivers, snake, sun, sun-goddess on March 2, 2015 by solsdottir.